Why Does A Meteor Explode In The Air? Dear Russians. I am sorry so many of you were injured and sustain property damage. However, I am very thankful for your abundance of car mounted video cameras. Keep up the good work. It’s a good thing BigFoot doesn’t live in Russia or he would have totally been “outted” by now. Also, some information about the meteor. Most of these are estimates, but they will at least give us a starting value to calculate some things. You can find many of these details on NASA’s page for the event. The meteor came in around 10:20 p.m. EST near the city Chelyabinsk. The object has a size (I guess diameter) around 17 meters. The object’s mass was around 7,000 to 10,000 tons. Disintegration of the meteor took about 32 seconds. Not sure this will be used here, but oh well. The meteor exploded about 15 to 25 km above the ground. It had a shallow entry angle of less than 20 degrees. I think the biggest problem with this meteor is that it is nameless (at least as far as I am aware). Can’t we just name this thing? Russian meteor event is such a boring name. How about Ruskeor? That’s not insulting to Russians, is it? I hope not. Also, I would like to call it a rock instead of a meteor. I was never fond of the whole meteoroid – meteor – meteorite classification. Oh well. Was it a rock? Was it a stony-iron like rock or mostly iron? If we assume the rock is a sphere with a radius of 8.5 meters and a mass of 6.4 x 106 kg to 9 x 106 kg, then we can calculate the density. The volume of this rock would be the volume of a sphere. Using both the lower and upper limits for the mass, I get a density between about 2,500 kg/m3 and 3,500 kg/m3. Well, this means it was not just an iron rock. That would have a density around 7,000 to 8,000 kg/m3. It would fall in the “stony” category. That’s OK with me. If you think about it, a meteor is kind of like Felix Baumgartner in the Red Bull Stratos jump. In the Stratos jump, Felix jumped from a balloon 120,000 feet above the ground. This means that he was able to in a region with very little air resistance so that he could get up to very high speed. When he entered the lower atmosphere, he was actually going faster than terminal velocity for that level. So, the air was slowing him down. At the terminal speed, the air drag force is equal to the gravitational force and the acceleration becomes zero. 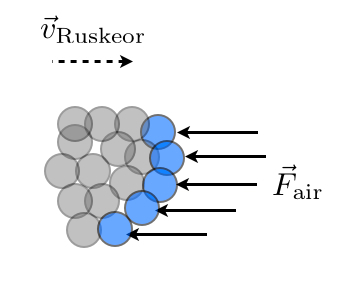 For Ruskeor, the rock was already going very fast when it entered the Earth’s atmosphere. There is no way the air could get it down to terminal velocity – there just wasn’t enough distance for a rock this large. But this air resistance is essentially the reason that it explodes. How do we model air resistance? For ordinary speed objects (like a basketball), we can use the following to determine the magnitude of the air drag force. Here, ρ is the density of the air. A is the cross-sectional area of the object and C is a coefficient that depends on the shape of the object. A sphere would have a C around 0.47. Even though this model most likely does not work for objects going as fast as the Ruskeor, I am going to use it anyway. At least it will give me a value as a rough estimate. What about the density of air? Near the surface of the Earth, I would just use the value of around 1.2 kg/m3 – but this clearly doesn’t work for higher altitudes. For the Red Bull Stratos jump, I used this air density model on Wikipedia. With this model, the density of air at 20 km above the surface would be around 0.095 kg/m3. Now I have everything I need to estimate the value of the drag force on the rock when it exploded. Plugging in the numbers, I get a value of 1.38 x 109 Newtons. This is also quite a bit more than the weight of the rock – with a gravitational force around 9 x 107 Newtons. But why would this make it break up? Let me draw Ruskeor as a collection of smaller pieces. Some of these Ruskeor pieces are colored blue. These are the pieces that interact with the air. So, the air pushes on these front pieces to slow them down, but how does the rest of the rock slow down? Simple, the blue pieces push on the other pieces. So, in a way, this rock is being crushed. Crushed because the air resistance force pushes on the front, but not the rest of the rock. How hard would you have to push on a material to get it to break? This is what’s called the compressive strength. Clearly, a wider material will take more force, so the compressive strength is measured in Newtons per square meter. Really, it’s the maximum pressure the material can take before breaking. Back to Ruskeor. Let’s say I take the drag force from above and this is evenly distributed over the cross sectional area of the rock (which it wouldn’t be). In that case, I can calculate the pressure on the rock due to the air. How does this compare to the compressive strength of different materials? I find The Engineering ToolBox to be a useful resource. It lists a compressive strength of 1.3 x 108N/m2 for granite and 6 x 107 N/m2 for limestone. If I had to guess (and apparently I do), I would say that a meteor has a compressive strength somewhere between these two materials. Of course you see that the pressure from my calculation is quite a bit smaller than even the compressive strength of limestone. I think this is OK. The air resistance on the sides of the meteor would probably be smaller in magnitude than in the center. This means that the air resistance on the center of the meteor must be a bit higher leading to a greater pressure. What if the meteor was bigger? Well, for one, it would be going faster. Why? The air drag is proportional to the radius of the rock squared but the mass (and thus the momentum) is proportional to the radius cubed. So, it would take longer to slow down in the air and it would reach the higher density atmosphere with a greater speed. What about the pressure? Both the pressure and the air drag force are proportional to the radius squared, so that wouldn’t do much. From this, it would seem that the biggest factor of whether a meteor explodes in the air or hits the ground would be the composition of the rock. I would imagine that an irony meteor would have a much higher compressive strength and be more likely to make it to the ground. But what do I know? I’m not a meteor expert. I just estimate stuff. Of course, if I were an expert meteor person I would be called a meteorologist.